What this means, basically, is that working long and hard will probably earn you lots of cash, but you won’t have much time left over to enjoy spending it. On the other hand, if you’re not working much, you may have lots of time on your hands but not much money with which to support your leisure activities. Which brings us to the subject at hand—establishing a lawn either by the laying of sod or by the sowing of seeds. (“This better be good,” you’re saying right about now, “‘cause this guy is pushing a metaphor way beyond the breaking point!”). Allow me to explain. Sod is money and seed is time. Sodding is the need or the desire for “instant grass”--from bare soil this morning to grassy lawn this afternoon. Seeding is patience--the act of planting, watching the seeds germinate, and the slow and beautiful act of green emerging from the brown earth. But enough of this poetry and drama—let’s get into some math. And pay attention back there, Freddie—at the end of the lecture, there’ll be a quiz question and the first respondent with the correct answer will win two free tickets to see the exhibit of antique tuning forks and pitch pipes now on display at The Musician’s Haul & Second-Hand Yard Art Emporium over on Harmony Street! Let’s take a sample plot of say 1,000 square feet. That’s a pretty small lawn—a rectangle about 50 feet by 20 feet, or a square about 32 feet on each side. Now let’s figure up the approximate cost to sod it or to seed it. The cost of a 50-pound bag of good hybrid fescue seed or bluegrass seed is currently about $70. We need about 10 pounds of seed per thousand square feet to get an adequate stand of grass if we are starting with bare soil. That means the cost of seed to cover our 1,000 square foot plot would work out to about $14.00 (that’s fourteen dollars!). We’ll want to add a good starter fertilizer ($25 to $35), a few bales of wheat straw to mulch and protect the seeded area throughout the germination period (another $25 to $35), and the rental of a slit-seeder or small tiller to loosen the soil, if necessary, before seeding ($60 to $75). All totaled up, we should come in at well under $200 to seed our 1,000 square foot plot. Now, for sodding. Currently, the cost of a 2 by 4 foot (8 sq. ft.) slab of bluegrass sod is about $5.00 (five dollars). We would need about 125 such slabs to cover our 1,000 sq.ft. plot. 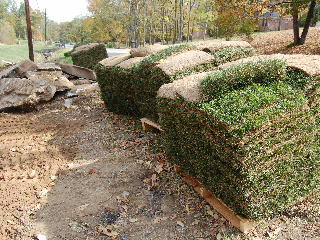 At $5 per slab, that comes to about $625 for the cost of our sod. Add in the cost of the starter fertilizer ($25 to $35), but not the cost of (nor the need for) the wheat straw or scarifying machine, our total cost of sodding the 1,000 square feet should be just under $700. 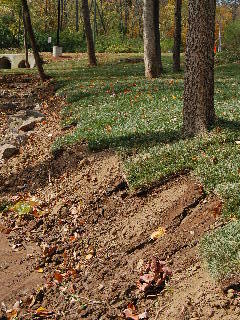 Note that some site modification may be required (like grading or adding topsoil) in order to prepare the area to receive the sod—this would result in additional cost. Have you neglected your lawn until it looks really scraggly and now you realize the family reunion is scheduled in just 2 weeks and is to be held at YOUR house?! Is the new governor-elect your old high school buddy (surprisingly enough! ), and now he wants to hold a celebration party at YOUR house to show he’s still in touch with the common folks?! If the answer to either of these two questions (or other wildly hypothetical scenarios) is “Yikes, yes!”, then you need sod! Are you a true hands-on gardener who just loves to be a part of the miracle of new life sprouting from and being sustained by our incredible planet? Are you astonished at the changes that occur in Nature on a daily basis and throughout the seasons? (I think you are if you’ve found this site and you’re reading this page!). If so, then you need seed! Remember—sod is money and seed is time. Now, on to the quiz question and the awarding of our prize! If 2.54 centimeters equals one inch and Chicago is in the Central Time Zone, then how much brown sugar does Aunt Hazel use in the recipe for her famous (and I might add delicious!) pineapple upside-down cake?